Mindfulness apps – aimed at increasing our daily mindful moments in order to enhance our emotional well-being, reduce stress and anxiety levels – are extremely popular in app-stores. This article summarizes our reviews of the top Mindfulness apps. The word “Mindfulness” refers to the opposite of the “autopilot” state. It is the mental ability to actively self-regulate attention to the present moment. When we are mindful, we become consciously aware of our experience, bodily sensations, thoughts, and feelings, without judging them as good or bad. Although Mindfulness is something we all naturally achieve, this mental quality is more readily available when we practice it. Mindfulness can be achieved through the process of meditation, which usually requires focusing on breathing, a phrase, or an image. Aside from having a mindful state, Mindfulness meditation was found to have additional positive side effects. These include: mental and physical wellbeing, the ability to concentrate better, stress release, and developing higher mental states, such as clarity or insight. Most apps offer short meditation sessions (2-25 minutes), which can be combined more successfully in daily routine. Since the effectiveness of Mindfulness exercises depends on the user’s persistence with them, promoting user retention is key. The option to track mental improvement or the presence of a narrator that walks users through the program, could serve this purpose. Clear and sufficient guidance for beginners is lacking in most apps. We have found Headspace and Calm to provide a sufficient guidance on that matter. Many Mindfulness apps contain specialized sessions for targeting specific issues (e.g., sleep, depression, and sessions for children). The specialized sessions further enhance the positive influence of Mindfulness practice in these targeted areas. Here are the top 5 Mindfulness apps, based on experts’ review. Available on: Website, iTunes (Apple), Google store. Cost: Free with some in-app purchase. Insight Timer offers guided meditations and talks by teachers in different languages. The app also enables users to see the activity of other nearby members (e.g., which tracks they have listened to), follow how many people are using the program around the world, and take part in groups focused on specific issues (e.g., “Beginner’s Mind”, “Women Meditate Worldwide”). Those community features contribute to a sense of togetherness while using the program. Additionally, users can track personal progress and make use of the meditation timer with background sounds. The app’s large selection of content offers users a diverse experience. However, for the beginner meditator, the selection could be confusing, and the program could use some more categorization to assist users in finding the most appropriate tracks. Program quality: 3.3 out of 5. PROS: Large selections of audio tracks/Free. CONS: Could be confusing for beginners. Available on: iTunes (Apple), Google store. With the purpose of reducing stress, Wildflower Mindfulness blends guided audio meditation with biofeedback, visual features, and psychoeducation. Before and after each audio meditation, the user measures his biometric responses (e.g., heart rate) and provides self-reported data concerning his state. This feature allows tracking changes in the user’s responses and mood. As the program learns about the user, it provides a list of suitable 5–10-minute guided meditation audios. Although the different features of the app are well designed and based on clinical information, their incorporation creates unnecessary complications and potentially distract the user from the main objective of meditation. That being said, the program provides proactive learning about the link between Mindfulness and individual stressful experiences, when most other Mindfulness programs do not emphasize this learning. Program quality: 3.4 out of 5. PROS: Low price/ Objective monitoring/ Good selection of meditations. CONS: Overly complicated, with meditations not receiving the main focus/ The program’s flow does not consider how users would utilize the app in the context of their daily routine. Stop, Breath & Think provides 27 free audio meditation sessions for adults, ranging from 2-20 minutes (with more sessions available through subscription) and three exercises for children. Users have the option to record their current physical, mental, and emotional state to get recommendations on suitable meditation exercises. The “record option” gives the users a moment of self-reflection before meditating. Charts allow users to track their usage pattern, their weekly progress, and their most frequently self-reported emotions before and after meditation. The option to compare the mental state and track its improvement, serves as positive reinforcement. For beginner meditators, the app provides a text-based introduction. However, the introduction is not highly engaging, and therefore, less efficient for learning the practice of mindfulness meditation. 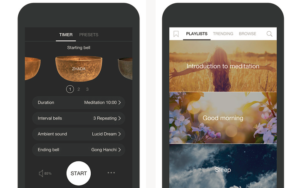 PROS: Meditation recommendations based on user self-report/The free version has a good number of meditations/Appealing design/ The audios are clear and pleasant to listen to. CONS: Lack of step-by-step tunneling for inexperienced meditators/Introduction is not highly engaging. Calm offers a free 7-day program that contains seven guided meditation audio sessions and individual guided or unguided meditation sessions, ranging from 3–25 minutes. 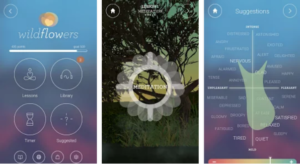 Additionally, Calm provides breathing exercises and free soothing nature sounds and scenes, which are used during meditation, yoga, or to help falling asleep. Furthermore, the app provides sleep stories, with a calming effect reminiscent of bedtime stories for children. With subscription, users can access a 10-minute meditation (added daily) and many other individual guided meditation sessions targeting various aims/needs (e.g., to calm kids, deep sleep relax). Calm also offers charts that allow users to track their usage pattern. Finally, thanks to its clear 7-day “Learn The Basics of Mindfulness Meditation” program, the app is recommended for beginners. Program quality: 3.5 out of 5. CONS: Monthly fee may be considered high. Cost: Paid with free trial. 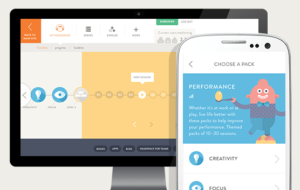 The main feature of Headspace is a daily 10-minute meditation session. It begins with a 10-day foundation training, which is free of charge and includes short animated illustrations conveying the rationale in a clear and simple way. For additional options, users can purchase access to the full version, which includes several themes (e.g., sport, health, relationships, performance). Throughout the program, Headspace founder, Andy Puddicombe, accompanies and guides the users. This creates a relatable experience and can strengthen the user’s motivation to continue using the program. Headspace can be used efficiently by beginners and advanced users. Furthermore, it is noteworthy to mention that the app offers meditation for children by age group (under 5, 6–8, 9–12). Program quality: 4.4 out of 5. PROS: Pleasant graphics and a welcoming atmosphere/ Relatable narrator/ Variable meditation options/ Suitable for users of all age groups and experience levels.